Guests in a small church are exciting! But sometimes our judgement gets clouded when we are excited. Some of the well-meaning small churches I follow online even have the audacity to call guests onto the stage and post a picture on social media. I can appreciate their joy at seeing someone new thinking about joining their church, but if I were this visitor I would be scared out of my mind. In contrast, a healthy church will make every visitor feel welcome and important while treating them as they would personally like to be treated. There are many methods for churches to attract and retain visitors – some good and some bad. 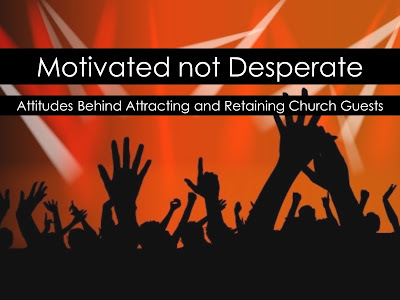 But for all of these methods, there seems to be two basic ways for a small or rural church to approach the topic: they can be motivated, or they can be desperate. A desperate church fears decline more than anything, including self-respect, personal space, social convention, or really anything else. The underlying error here is fear. We know that God is not the originator of a spirit of fear (2 Timothy 1:7), so we certainly shouldn’t run our churches based on fear as well. The most important part of diagnosing this issue is learning to discern the difference between being driven to expand the kingdom and being afraid of failure. They look very similar, but not only are the results different, there is a heavy personal toll for the ministry lived in fear. A fear-based model will put stress on a leader regarding the issue to the point of hopelessness or exhaustion. A fearful individual may also be more prone to compromise their beliefs or God-given ministry vision because they are willing to do anything to try and please people. (See: “Will a New Church Attract Troublemakers?” for a discussion of how to avoid compromising the mission in exchange for trying to retain a guest with specific requests). Motivation is scripture driven, while desperation is derived from a corporate model that is constantly looking to measure and judge you on performance-based success. With this in mind, a healthy model replaces measurements like attendance and number of events with obedience. A motivated believer needs to be laser focused on being where God want them to be, because they understand that He is the one that is actually going to bring true success in the end. Both the desperate and the motivated disciple will be busy, but only one will be able to sustain the work and truly be at peace with their place in the body of Christ. There is nothing more motivating than the Great Commission, and Jesus certainly calls for actual action (Matthew 28:19-20). But let’s be sure not to replace a healthy passion for seeing God’s kingdom expand with a feeling of desperation. Too many church leaders are exiting the field on a stretcher while God is sitting on the bench waiting to be waved into the game. 1. Don’t go too public with church service visitors (i.e. social media posts, etc.). In a small town, people don’t visit church lightly. Often, they may “belong” to a family church somewhere nearby even if they haven’t attended in years. Make sure you allow them to be the one to break it to their aged grandma that they have switched congregations (or even denominations) instead of her newsfeed. 2. If you use a visitor card, read them to yourself as if you were a guest who has never been to church before. Many premade visitor or connection cards ask questions that only longtime church goers can understand or identify with, so make sure yours is ready for all types of guests.